Painful and tensed muscles can get in the way of your daily physical activities. As a result, you’ll be less productive and effective in your work. Apart from that, sore muscles can also make it hard for you to socialize and be at your best. 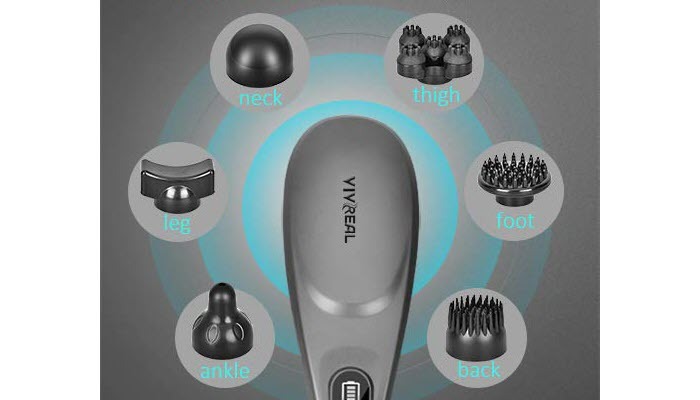 Vivreal Cordless Handheld Massager features 6 interchangeable nodes. Switching among those nodes enables you to have a deep tissue massage experience like what a real masseuse can provide. They work well on different body parts, including your calves, shoulders, elbows, thighs, feet, and arms. This massager is cordless and rechargeable, allowing you to get a deep tissue massage anytime and anywhere you want. It can run for up to 100 minutes on a single charge and that’s pretty impressive. In addition to the interchangeable nodes, this device also features 6 different speeds and modes so you can set it up to function the way you want it. It’s designed with a powerful motor that can provide 3200 pulses per minute. So, if you are having a really tough day at work, you can certainly look forward to using this massager and melting your stress away. Nursal Handheld Deep Percussion Massager with Heat also features 6 interchangeable nodes. It’s designed to provide a more relaxing experience because of its heat function. You see, the application of heat can provide pain relief, eliminate fatigue, and ease tensed muscles. It can also help loosen tight muscles. It’s comfortable and easy to use as well. It has this long anti-slip handle which makes it easy for you to access your body parts, particularly your back and shoulders. One issue you’ll encounter with this device is its weight. It’s a bit heavy so you’ll need to use a second hand for support. Now, don’t worry as it’s not a huge inconvenience. It’s still comfortable to use despite that. 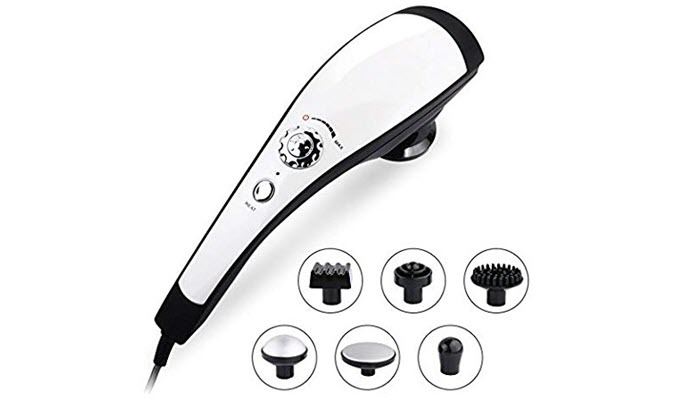 Mo Cuishle Electric Handheld Massager, on the other hand, has a pure copper motor which makes it durable and strong. 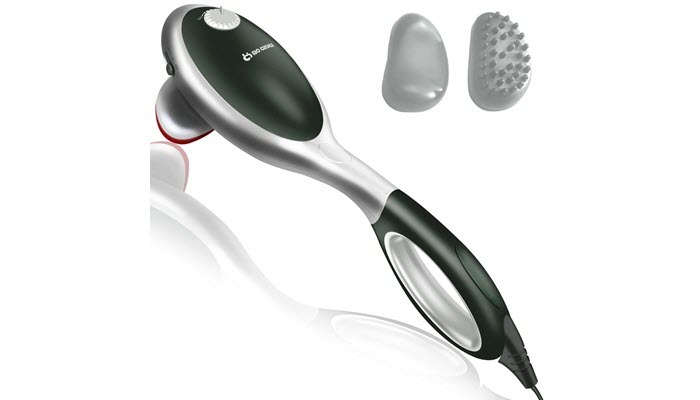 Its massage head is designed with silicone to ensure that you get the most comfortable massaging experience possible. Its cord is about 2 meters long. 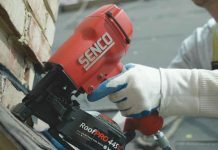 So even if it’s not entirely cordless, you won’t find it limiting, particularly when massaging hard-to-reach areas like your back. The massager has a nice strength and vibration. It also produces enough heat to boost blood flow and promote healing. One thing you might not like about it is the position of its controls. They are on the head part which means that you have to use two hands to adjust or turn the massager on or off. 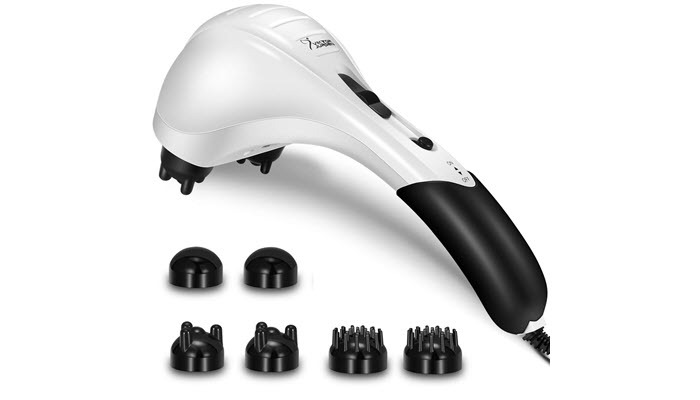 If your budget is tight but you still want to experience a deep massage at home, Viktor Jurgen Handheld Back Massager is an excellent choice. Even though it doesn’t cost as much as the other devices on this list, it can still deliver impressive results. The device comes with 3 sets of removable massage heads to give you a variety of options. They are great to use on your foot, legs, back, and neck. It also has a powerful motor which is able to run for up to 3,350 pulses per minute. It provides just the right intensity to ease muscle pain and help you achieve relaxation. Its hand, on the other hand, offers a comfortable grip. It won’t slip off of your hands easily. 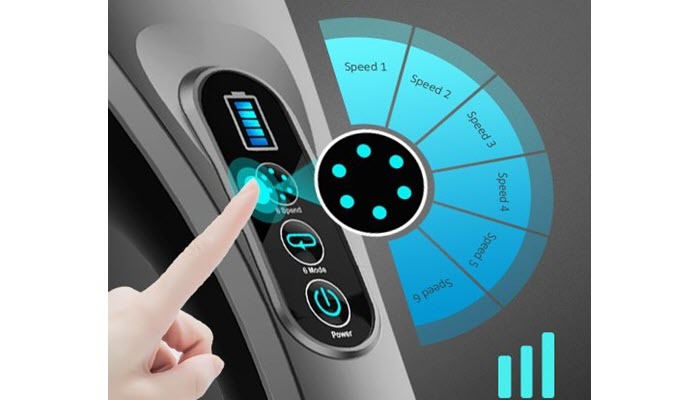 A massager with adjustable settings and speeds allows you to set up your device the way you want it. Apart from that, it also enables your whole family to adjust the device according to their comfort and needs. A massager with interchangeable heads enables you to get the right massage for your target area. The extra attachments also allow you to get a different massaging experience each time. This will depend on your preference. If you are the type of person who likes to travel, you’ll be better off with a cordless and rechargeable massager. If you don’t like charging your unit all the time, then a corded massager will work best for you. Just be sure to pick one with a long cord so you can reach certain body parts with ease. For deep tissue massage, devices that work by the percussive method give the most relaxing experience. 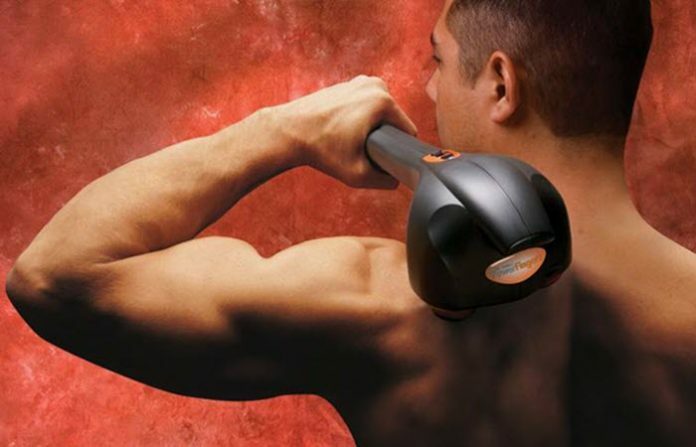 For sore and painful muscles, it’s best to get a massager with heating options. The warm temperature can provide relief and stimulate better blood flow which can facilitate repair. Research suggests that good blood flow is important in helping your muscles recover. Finding it hard to choose? Well, for us, Vivreal Cordless Handheld Massager is easily the best deep tissue massager. With 6 interchangeable nodes, you can set it to provide the exact type of massage you need for pain relief and comfort. Plus, it’s cordless so you can take and use it practically anywhere and anytime you want. It can work for 100 minutes, allowing you to complete your massage session without interruptions. Now, if you are looking for something that can ease your heel pain, check out the best foot roller for plantar fasciitis. If you are looking for more complete relaxation, why not invest in the best massage chair? And to complete your at-home relaxation, find out the best sauna you can get today. 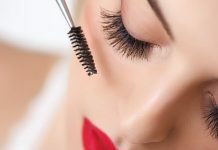 A word of caution: While massagers, like the ones mentioned on this list, are helpful for pain relief and relaxation, it’s best to consult your doctor first if you have any existing medical condition. Additionally, if you feel that your pain worsened after, stop using your massager and see your doctor.